By Erol Avdovic – WEBPUBLICA (United Nations) – The United Nations remains committed to working with Former Yugoslav Republic of Macedonia (FYROM) and Hellenic Republic of “in finally resolving the difference between them,” said UN Secretary General Personal Envoy Matthew Nimetz in a latest statement after the both governments in Skopje and Athens finally obliged to settle the longest ongoing Balkan and European bilateral issue, not counting another UN covered dispute in Cyprus. Only a step away from 28 years long dispute and start counting FYROM, who became the UN member state on 28 July 1993, now under the new name – the Republic of Northern Macedonia, United Nations correctly shows the utmost caution, knowing how slippery is Balkan political field, where bitter nationalism often defeats sober rationalism and a better political prospect. Despite all needful salutation and the prize of the United Nations Headquarters, it is fair to say that – the final agreement between FYROM and Greece is yet not completed, although signed and reinforced by firm mutual commitment. The UN looks closely at what is happening to the Athens government’s efforts to secure this deal – as optimists hope. And, the King-Maker is still the Greek Parliament which has to ratify the deal by the end of this January. The left-wing prime minister Alexis Tsipras is hinting if not promising to provide 153 hands in a 300 members Greek Parliament which is more than a simple majority of 151 for a deal to go through. Tsipras’ party Syriza is the coalition of far left and has 146 representatives in Parliament. In a meantime, thousands of protestors floated the streets in Athens to seek the public referendum for name changing of FYROM to the Republic of North Macedonia, but according to the reports those protests didn’t reach the massive public outcry as Greek opposition, nationalistic circles and the Orthodox Church have hinted. 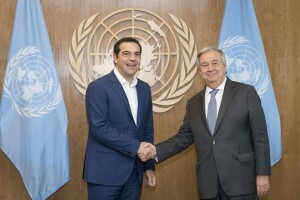 The deal was heavily supported by leading Western Countries – the United States and European Union, which Greece is a member – is compromise reached under the umbrella of the United Nations between pro-western Macedonian prime-minister Zoran Zaev and his Greek colleague Tsipras; it was signed last June at Lake Prespa, at the Greek-FYROM border and it is now known as “Prespa Agreement”. Bearing in mind that nothing is over until is all over, UN told Webpublica last week in New York – the offices of Secretary General Antonio Guterres Personal Envoy ambassador Nimetz will stay open until the agreement is fully completed. 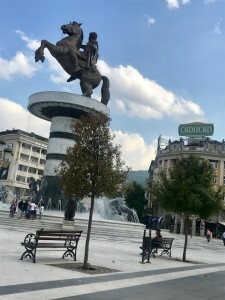 In fact, Mr. Nimetz clarified it himself in a written statement sent to Webpublicapress on Sunday – stating what is be next in implementing of the Prespa Agreement. There are legal and political steps ahead that can not be missed at all sides – in Athens and Skopje, UN said. 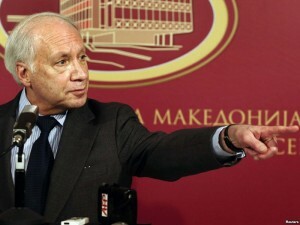 completion of the related constitutional amendments and its internal legal procedures for the entry into force of the Agreement, consideration and subsequently proceeding with the ratification of the Agreement by the Hellenic Republic, through its national processes, would be in conformity with the relevant provisions of the Prespa Agreement,” Nimetz’s statement reads. It’s understandable the precise procedures are still of concern to ambassador Nimetz. He is in international arena diplomacy for a long time to know all the importance of details, and of course the protocol and timing. Although an American, which almost by default means robust even when a diplomat, as UN envoy Nimetz was proudly corresponding more with UN diplomatic culture. He applied silent shuttle diplomacy between New York – Athens – Skopje, and of course, to Washington. But we didn’t know the important details at the time. And he was secretive as well being envoy fon Macedonian issue for President Bill Clinton. Mr. Nimetz’s style is the living opposite of the US ambassador to the United Nations late Richard Holbrooke, who also worked for the US President Clinton – and achieved peace in Bosnia and Herzegovina in the autumn of 1995 (Dayton Peace Accords), and was therefore called “a bulldozer of diplomats” , who ultimately wiped out big mistakes. Nimetz could get the name “Gentleman Diplomat” – quiet, but determined, and most importantly – one that avoids mistakes in advance. And he chooses the right and kind motivational rhetoric when needed. submitted to Athens a Note Verbale on Prespa Agreement (signed on 17 June 2018), advising about the completion of legal procedures and changes and adoption of amendments to FYROM Constitution. He announced that he has also received that document. Probably as a gold copy. Nimetz said with traditional calmness. And, again – UN Personal Envoy of an already 28 years old Macedonian name dispute is still traditionally cautious. According to the latest Greek media-commentaries made after the leading Athens newspapers printed the text of Prespa Agreement which recognize the existence of Macedonian Nation as such and the same name language within the borders of their northern neighbor – the “game is over”. Many are not happy with that. But caravans have to go on. 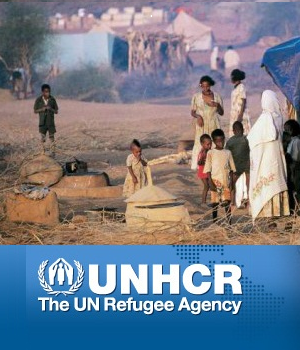 As for the United Nations, it is even practical to be cautious. Rightly so, since there have been many shortcomings in their recent history in the Balkans. UN have long desired this Macedonian “play” or rather political theater with some time real diplomatic war between the two southern Balkan states finally end-up for the goodness of two states. But also because of the halo of success that the United Nations will be able to add to itself, in a world where it is little or virtually no UN multilateral triumph.